Give Hope – Elah Ministries, Inc. There are times in all of our lives that we feel that what we do is not worthwhile or significant and that no one cares. There is One who does care and regardless of what society, an individual, or even small groups of people think, we are significant in the eyes of the Almighty Lord. I have gone through those times at various times of my life. I was insignificant in a dysfunctional family growing up. But God didn’t see me that way! He gave me the ability to survive the atrocities that were being inflicted upon me by others. I was loved by the Great I Am! Through the years I experienced what could be called “love” from others. Men who I thought I could be the “apple of their eye.” Only to be used as their “conquest.” I have experienced the rejection of others more times than I can count, but God never rejected me! Through the years I have learned many lessons in this journey through life and most have been valuable and some inconsequential. But the one thing I have finally learned is that no matter the circumstances we find ourselves in there is One who knows every tear we shed, knows every bit of the hurt we feel, knows every disappointment, has bottled our tears and has stored them in a secret place in heaven. He knows our heart and when we reach out to Him or to others. He cares! Today, I am feeling quite humbled that the Lord my God, my Savior Jesus Christ would use someone like me, someone who rejected Him for years, to bring hope to others who are going through tough times. My fingers are sore. I have a callous on my thumb from a crochet hook flying through the yarn. I am greatly humbled that the gift, or talent, He has given me is bringing joy to several patients with hair loss, vomiting, and fevers from the side affects of chemotherapy. 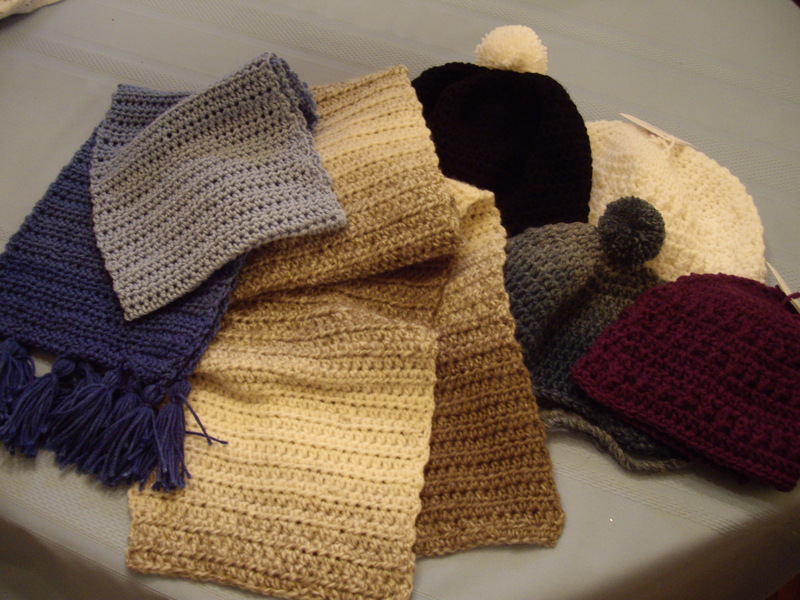 The hats and the scarves that lend warmth on a cold winter day seem like such a small gesture but the joy in the eyes of those who are suffering makes it all worth while. There’s no intend of patting myself on the back. I give all praise, honor, and glory to the Lord Jesus Christ for how He can, and will, use me and you to bring a little joy in the lives of others. So what is my message here? No matter what your circumstances, no matter what life has shoved at you, you can be used by God to bring a smile, a tear of joy, and hope to others. What has the Lord Almighty gifted you with? What talent can He use through you to give hope and joy to others? Let His Holy Spirit work through you, within you, and for you. His healing from all those life situations and circumstances will bring you the joy and peace that only He can give and with that same Holy Spirit you can share it with others. Let His light shine within you and through you and fill the hearts of others. That is the message on the little tag I attach to each item given.